This entry was posted in Nature, Wildlife and tagged animal welfare, birds, fish, frogs, hedgehogs, horses, pets, ponds, RSPB, squirrels, winter. Bookmark the permalink. Give a helping hand to our wildlife. We have to help wildlife as much as we can during the cold weather, although I don’t have that problem here in Oz, but when I lived in the UK, I remember how bad it can get for the wildlife there. Thank you for the list, it’s brilliant. Thank you Barb, glad you liked the list. It is so important that people remember our wildlife at this time of year. I guess it must be mid-summer in Oz at the moment. Been there a couple of times to watch the Ashes cricket in Melbourne and Adelaide and had a great time, travelling around the country as much as I could. It’s a great list and I felt compelled to re-blog it to remind people about the predicament of wildlife during the colder months. We are in summer now (Dec-Feb) and it’s already stinking hot (I hate our summers). It was in the high 30’s last week, bit better this week at 27. Did you like Oz? There’s lots to see. I love our wildlife with a passion. Yes I loved it. Visited Sydney, Melbourne and Adelaide. Would like to go to the Gold Coast next time. 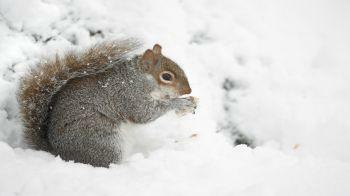 Give wildlife a helping hand during the cold weather. I was feeding rabbits, squirrels and birds, and then a stray cat came to my door. We adopted him, and he now “lives” on our patio …. but the squirrel, birds and rabbits were not pleased, and have all moved on. Cat trumps bird and rabbits, I guess. Yes, having a pet often puts off squirrels and birds. We used to have a big dog who would wolf down any food we left out! A truly great post and the reminder not to forget your pets whilst celebrating is just the ticket for this time of year. As I now live in Portugal I no longer have the need to clear away a patch of snow and feed the birds with raisins, strips of fat and other such delicacies and then spend a good amount of time watching the birds have a good feed. Many thanks, I’m envious of your good weather in Portugal. It’s absolutely freezing here tonight! Excellent tips. We don’t get that cold here, but father north the winters can be very hard on wildlife, particularly during times of extreme cold, wind, ice and snow. Thanks Jo Ann, yes I imagine it gets very cold up north. The Blue Ridge Mountains must be a great place to live for a nature lover. They are close to the Appalachians aren’t they? The Blue Ridge Mountains are a part of the Appalachian Mountain range just like the Great Smokies are a part of the same range a bit farther south. Reblogged this on Wood and Field. There was a mix-up when I mistakenly reblogged this from a site that reblogged it from you! I think now it has posted correctly giving credit to you. Sorry for the mix-up, but I think it was an excellent and important post! No problem Jo Ann, thanks for crediting me. Thank you for this. May I add that wild animals can become dependent on humans’ feeding and watering, just as pets can. With territories, habits and so on, they may not have real options of going elsewhere when people are away for holidays. I stopped feeding birds in my garden because I knew that I’d disappear for a week or two every year in December. If there’s never been food for them here, they won’t expect it here. Yes, that’s a good point, especially as many people go away at Christmas. we feed the birds all winter, and have about 10 varieties here every morning, not counting the ringed neck pheasants who number a couple of dozen at the back of the house, eating corn while one stands lookout. You would love our little read squirrel who has figured out that Sophie the cat knows she can’t catch him in the tree. He has a route from tree to bird-feeder and back, without his little feet ever touching the ground. From tree, to bird-feeder, to porch railing, to antenna tower, to roof, to tree! We had a squirrel like that, he jumped from tree, to fence, to clothes line, to bird feeder in a blink of an eye. Happy New Year! Thanks for helping me find you and for spreading the wildlife love! For the first time, we’ve put out freeze dried meal worms in addition to our other assortment of wild bird delights. So far, no takers on the worms. Hmpf! Sounds like your doing a great job feeding the birds. Thanks for visiting and Happy New Year! All the wild birds out here are just as plump…check out the finch from a couple of posts ago! LOL! He is eating well! I am so glad I found your blog….this is wonderful and its the little things like this that you are doing that give me hope this planet MIGHT have a chance. Many thanks for your kind words Lisa, I’m very glad that you like the blog and find it useful. Those are all very good tips, but I think that they left one thing out, a source of water for wildlife, especially birds. Some of the best places I find to photograph birds in the winter is around an unfrozen source of water that they can use for drinking and bathing. Yes good point, water is very important to wildlife in this icey weather. Thanks for visiting. Thank you for your very helpful list. We had squirrels starving one winter and didn’t think of feeding them, new to living in the country. Think I will reblog the list– it is so important. Glad you found it useful, thanks for reblogging! Reblogged on SafariCam (http://safaricamkenya.com/) – cheers, great tips. Thanks for caring about wildlife and wanting to help them!